Belize NMS: Light easterly airflow prevailing. Slightly moist conditions prevail supporting a few showers over some areas. 24-hour forecast: Sunny with cloudy spells today and partly cloudy tonight. Showers or thunderstorms will be isolated, except for a few more over the interior after mid morning into this afternoon, and over the extreme south tonight. General Outlook: (Sat & Sat night) Similar weather conditions. 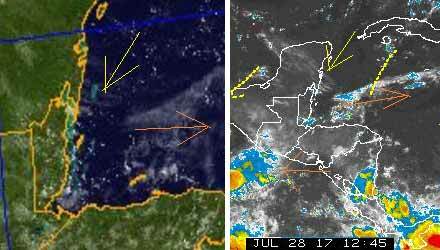 Today E 5-15 kts Light Chop 1-2 ft ISOLATED SHOWERS OR THUNDERSTORMS. Tonight E 5-15 kts Choppy 2-3 ft ISOLATED SHOWERS OR THUNDERSTORMS; A FEW MORE SOUTH. Tomorrow E 5-15 kts Choppy 2-3 ft ISOLATED SHOWERS. Outlook E 5-15 kts Choppy 2-3 ft A FEW SHOWERS OR THUNDERSTORMS SOUTH. 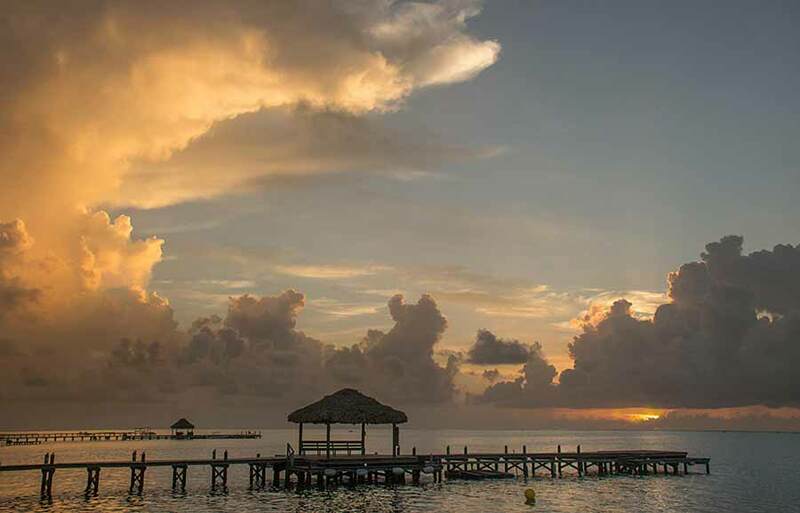 On Ambergris Caye at sunrise the sea is flat calm and we have a hint of breeze from the East. 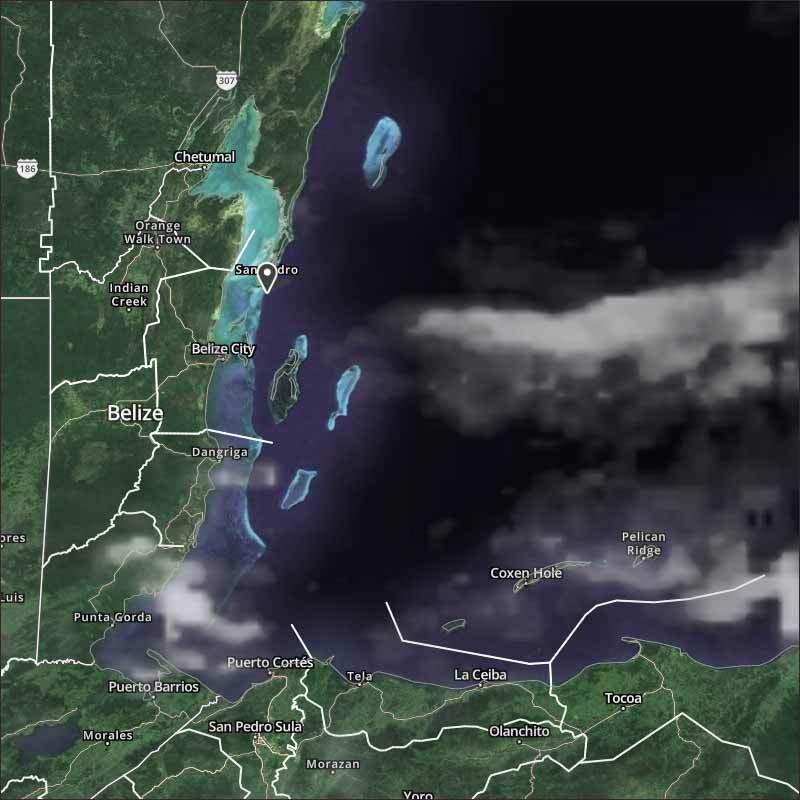 Our expected high is 88 f.
There appears to have been a vague front go over Belize yesterday, which caused those scattered rain showers, with the winds from Florida contributing. The north winds are still just coming our way, but most of the high level cloud that contributed to all those flair-ups yesterday afternoon, evening have rapidly dissipated, we are nearly clear of high cloud. At this time, there is no apparent easterly Caribbean wind, but it will pickup later, as the sun warms the land. Looks like today will be a dry day, mainly sun, before the white clouds develop, no rain at present, could be some late this afternoon.